Gold balloons tied to a chain link fence in Egleston Square. Stalks of sunflowers blooming throughout Roxbury. Strangers playing the drums together in the East Boston Shipyard. Portraits of high school students, dressed in traditional West African adornment, placed as placards in Dudley Square. A skeleton of a house placed within a vacant lot in Four Corners. Are these artworks, you ask? In a word, yes. These components are part of the very first cohort of Now and There’s Accelerator public art program, which provides crucial training and support to Boston artists ready to take their work from the studio into public space. These works, Golden Home, The Roxbury Sunflower Project, HD•BPM, The Founders Project, and Lost House. each vary wildly in material, scale, place, and aesthetic. However different, each offers an experience. They are artworks in that they take social exchange as their main medium and participation as their most critical material. “The idea of making my own, specific, personal art in the public realm is less exciting to me than to create connection and community through my projects,” says Ryan Edwards, who presented HD•BPM along the East Boston Shipyard on the nights of August 30 and 31. 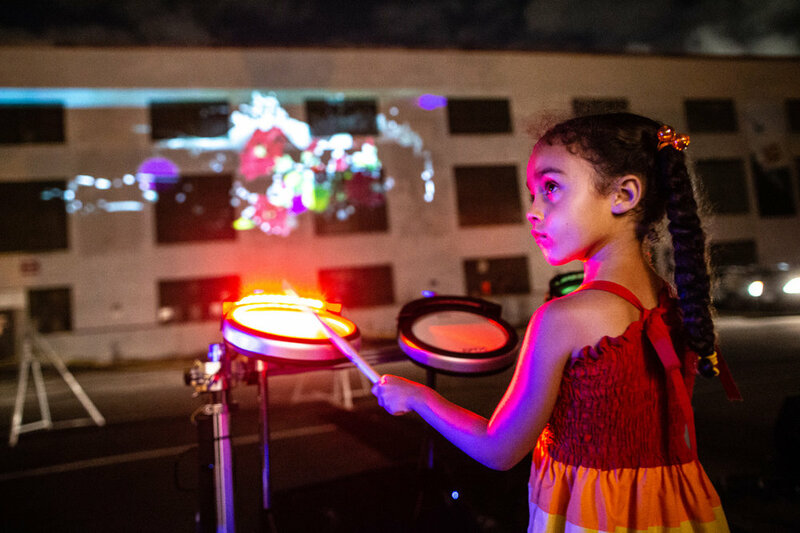 An interactive work projecting images of local artists’ work onto the side of an old industrial building along the Shipyard, HD•BPM asked viewers to pick up drumsticks and play, each tap to the beat “painting” a pixel of the projected image. When I arrived at the Shipyard on the night of August 30, I admit that I didn’t totally understand how this would work. But approaching the drum pads facing the colorful projected images, I started to appreciate how HD•BPM created an immersive, dance party like atmosphere encouraging people to let go of their inhibitions. On the drums with two others, I couldn’t tell which pixels appeared through my play, but it still felt satisfying to see an image emerge. Once the image was complete, I handed off my drumsticks to someone eagerly awaiting their turn. That’s when HD•BPM totally clicked with me: the play of making music and images also makes something of a chain reaction, with each participant linked to each other. Ryan provided the scene and a prompt, but HD•BPM was only realized when we played together. “I think to me that is what excites me about public art, the idea that it cannot be finished, it can only be prepared,” he told me. Similarly, Stephen Hamilton’s The Founders Project corrects an omission from history, this time that of Pre-Colonial African narratives in mainstream education curriculums. The Founders Project engages specific BPS high school students to depict West African ancestors. Using methods, techniques, and materials from the West African tradition, Hamilton and his students create costumes and backgrounds that the students are then photographed in. Later this fall, the photographs will be printed and exhibited in Dudley Square’s Bolling Building. The project “reimagines Boston Public School Students as the legendary founders of West and West-Central African ethnic groups.” Central to this project is representation. By learning about and assuming the role of these African ancestors, the students may better represent that history in their own lives; by being represented in the Bolling Building, Hamilton projects the students and this African history onto a piece of government infrastructure. Left: Stephen Hamilton paints Queen Poku Right: A Boston Public School student portrays Queen Poku in textiles created by Hamilton using traditional African techniques. GLD’s Lost House likewise supposes a narrative and history through physical representation. Discovering the city-owned vacant residential lot at 405 Washington Street in Dorchester--a razed plot of land, overgrown with grass, but still with a set of cement steps--husband and wife design team Cynthia Gunadi and Joel Lamere were inspired to build “Lost House,” a trellis-like sculptural shelter evoking the possible past and future for the site. With a house’s pitched roof and permeable wooden framing, the sculpture recalls local architecture and nature, while also offering a new site for rest and reflection. Once installed, a temporary outline of the house that once filled this plot will contour the site. This ghost of an outline emphasizes the loss of the nineteenth-century house specifically; since the original house was demolished in the 1970s, there’s no evidence in public records or the neighborhood’s collective memory of a structure on the site. “What does it mean to own a piece of land that is vacant?” wondered Cynthia as we talked about the project and GLD’s hours of pouring over public records and conversation with the site’s neighbors. Cynthia and Joel plan on sharing this research, including aerial photos, maps, and deeds, through a website after “Lost House” is installed in hopes that people who experience the sculpture will be inspired, like they were, to learn more about why it’s empty. Ekua Holmes’ Roxbury Sunflower Project also examines the idea of empty lots and public space. This multi-month and multi-site installation has a singular purpose: to cover the neighborhood in sunflowers. Last June, Ekua shared 10,000 sunflower seeds with friends and neighbors in her native Roxbury, and over the summer, a multitude began blooming in vacant lots, gardens, and in front of the Freedom House. These tall, hardy flowers, which can subsist on rugged terrain, even with little water, are meant to symbolize Roxbury’s resilience and tenacity. Residents could watch the sunflower stalks grow before they bloomed into a bright yellow flower to be enjoyed as the summer transitions to fall. Weathering the seasons, the sunflowers and their collaborative planting is an homage to the artists and mentors who have supported Ekua throughout her career. I stumbled upon a set of sunflowers, planted directly across from the Egleston YMCA, as I walked to Lina Maria Giraldo’s Golden Home one warm evening in September. Delighted by this little forest of flowers, I turned to see a flank of yellow balloons, each emblazoned with an outline of a house. As if announcing a real estate showing, the balloons brought passers-by to the YMCA, where Lina was stationed with pamphlets. But instead of selling houses, Lina is there to record personal perspectives on housing struggles. Documenting individual stories through sound, video, and photography, Golden Home is a collaborative storytelling project that presents a communal portrait of a neighborhood weathering the change of rapid development. Lina was interviewing a woman and her son the evening I visited, questioning them on their experience and idea of affordable housing. Once the interview is complete, Lina takes the participant’s portrait (as long as they are willing). Twenty-six of these portraits have been blown-up into vinyl decals and affixed to the windows of the YMCA. Recalling a commercial bank’s marketing signage, the portraits will function as advertisements to an authentic Egleston Square, one in which there’s a home for all. Golden Home cheekily inverts these commercial tropes, but the golden balloon also poignantly represents the fragility of housing and Boston’s neighborhoods. With the influx of luxury development, our housing can easily disappear, just like a balloon floating away. With this in mind, Lina is also teaching a group of neighborhood high-schoolers oral history and documentary techniques this fall. Her classes taking place at Greater Egleston High School (which shares a building with the Egleston Square YMCA, Egleston Square Main Streets, and the Father Jack Roussin Community Center, now festooned with the community portraits), Lina will help students understand how they can record their own personal stories, thereby offering agency to their individual perspectives. The students will also create an online map to the neighborhood, reclaiming public space through personal stories. Community portraits adorn the Greater Egelston High School as part of Lina Maria Giraldo’s Golden Home. Remembering, documenting, and memorializing a changing neighborhood is key to Golden Home, but the project also recalls another era. When else but the 1980s? It was the decade when community-focused, participatory, and educational projects came to the fore as artworks. This is when, as Tom Finkelpearl writes, “works that examine or enact the social dimension of the cooperative venture, blurring issues of authorship, crossing social boundaries, and engaging participants for durations...gained a strong foothold in more public venues.” The 1980s sowed the seeds for a flexible, interdisciplinary art practice that we now call “socially-engaged” art works that (in a nutshell) seek to correct a social injustice, provide a service to participants, or use social conditions or phenomena as its form. The Accelerators each use or respond to this tradition; they also have a direct predecessor in UrbanArts’ “Educational Programs” a collection of socially-engaged artworks initiated through the 1983-1987 Arts in Transit program. Arts in Transit placed permanent and temporary art along Boston’s Southwest Corridor (also known as The South End, Roxbury, Jamaica Plain, and Roslindale) during construction of the Orange Line. “The Artist Lens: A Focus on Relocation” and “Sources of Strength: People & History Along the Southwest Corridor,” both initiated in about 1984, offered photography and oral history training to local participants, produced their work, presented it for publication and exhibition. More than just a recording of what was changing and lost during Orange Line construction, these projects connected the seven Boston neighborhoods affected by the destruction of the Washington Street Elevated. Like the Accelerator projects, they were activated by participation. They had to be experienced, and through that experience, they sought to empower. In my next post, I’m going to deep dive into UrbanArts (its context, the people behind it, and what it achieved) to better understand Boston’s public art history. I’ll talk more about Arts in Transit, the permanent works you can still visit on the Orange Line, and its “Educational Programs.” By taking a long look at Arts in Transit, I hope to shed some light on how experience became art in the 1980s.